Something New- Decaff?????? – Food. Boom. I’ve not had much to say of late, for reasons which will soon become apparent. So let us start by flashing back to a couple of weeks ago on a Friday lunchtime rush round the aisles of Asda. Not something I usually enjoy because yes, I am a supermarket snob and my local Asda is a hell hole of drooling backward checkout staff and customers who think it’s ok to go out in public in dirty pyjamas. Vile. But by chance I was there and I needed goods for the weekend, and my eye stumbled across a bag of organic ground coffee for less than three quid. Hmmm. I do like to go organic when possible and by ‘possible’ I tend to actually mean ‘affordable’, and this was both. 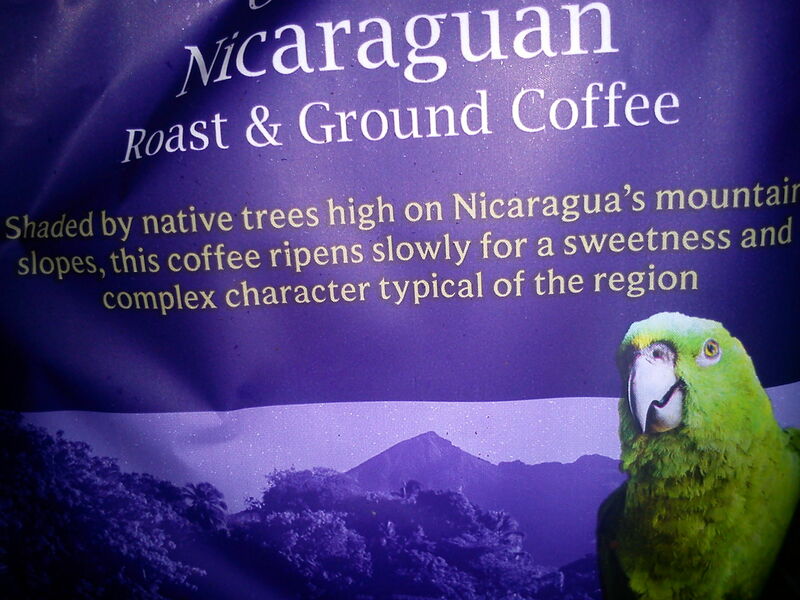 And it had a parrot on the pack. In the basket it went along with a loaf of bread and a kitkat chunky and I was bolting for the exit again. Skip some irrelevant action in the office and overnight to get to the next morning, Saturday morning, which means some good fresh coffee and two hours of cooking shows on the beeb. Yes people, in my hurry to get back into the company of people who dress in daytime clothes, I had not noticed that little pale blue tag on the packet of coffee. It was decaffeinated. Horrors. Now, I’m not any kind of caffeine junkie and I drink coffee because I like it, I freely admit I enjoy a lower caff brand once in a while but de-caff for the most part I find massively lacking in flavour with an oddly flat, biscuity finish that reminds me of the smell of fake tan. Don’t like it. Don’t drink it. Adsa’s finest or special or whatever it calls it Nicaraguan Organic went into a box and into the fridge for extended ignoring. 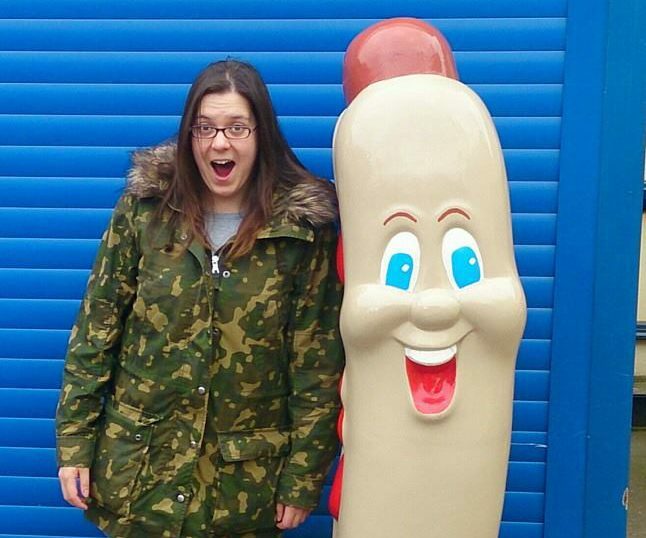 Then a week or so later there was a drunken moron in need of aid on an icy slope and an even more moronic food blogger who decided to try and help them. There followed a loud bang, a louder yell of resultant rage, a trip to the hospital and a moderate concussion. Concussion is no laughing matter let me tell you and apart from the ringing ears, fuggy head and inability to lay down and sleep you also have to remember a long list of stuff you aren’t allowed for fear it may worsen your condition. Many of these are things you don’t want to do with a skull splitting headache anyway, like dancing or driving or going to work. No thank you. But then hot baths, ibuprofen, booze and, would you believe it, caffeine suddenly all became exotic contraband with the potential to create furious craving. I could have screamed but it would have hurt my already wobbly brain. I would have cried but oh, hang on, what about that decaff organic gumph I heartily shunned last week? This was clearly a desperate time requiring an equally desperate measure. I wont go overboard, I don’t love it or prefer it to my usual morning black stuff, but in a pinch it was more than sufficient, maybe surprisingly bearable I did use a little more of it in my humble coffee machine than I would with a trusted favourite, and the result was a pleasingly thick, dark and fragrant brew. I wonder sometimes if the smell is as much of the experience as the actual imbibing. It didn’t have the odd, chemically aftermath I usually experience with decaffeinated coffees which could be due to the organic aspect or the country of origin or a million other things, I don’t know. There was also a smooth, subtle sweetness to it which I think may not have been as evident in a less strong armed batch than the several pots I brewed up. 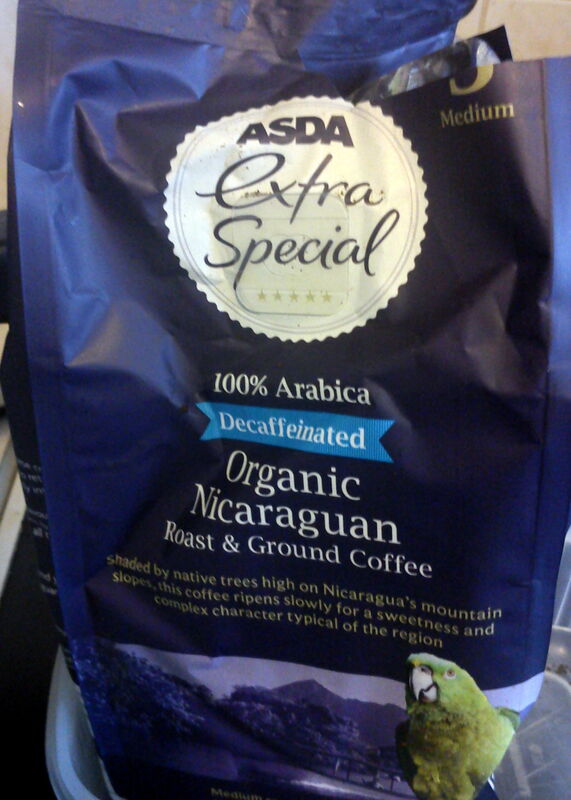 In summary- Asda Nicaraguan Organic Decaffeinated Ground Coffee is not bad at all. It is tasty enough and kept me happily hydrated through several days sat on the sofa waiting for the cartoon birdies to stop flying around my head whilst I watched endless episodes of Breaking Bad and Mad Men (love you Don). It was another new thing that didn’t hurt me, but I’m not sure that I’ll be turning this mistake purchase into a regular one, further blows to the bonce notwithstanding. It also has a pretty purple packet with a parrot on it.